A pro-Democracy and Non-Governmental organization, Human Rights Writers Association of Nigeria, HURIWA, has stated that the Presidential jet should not remain with President Muhammadu Buhari in London because it belongs to Nigeria. The group made the remark while faulting the Presidency over its reason why the Presidential jet was retained in London while Buhari undergoes medical treatment. Reacting to the reasons given, the human right group said it makes more economic sense to park the Presidential jet in Abuja the political soul of Nigeria. The right body challenged the Presidency to disclose to Nigerians any evidence of this kind of prolonged medical sojourn abroad by any political leader of a country to justify his claim that the practice was a global standard. It also wondered why Nigerian Government would accumulate huge expenses in parking the Presidential jet idly for many days and even maintain the accommodation of a retinue of pilot and flight attendants attached to the Presidential fleets. The group reminded the Presidential spokesman that David Cameron as Premier of Britain was photographed taking a ride on a public underground train. HURIWA insisted that the Presidential jet if parked in Abuja will costs nothing and that it will take few hours to be flown to the UK any moment the ailing President recuperates and wishes to be flown home. “The other time, did the Acting President Professor Yemi Osinbanjo not fly into Italy for the G7 global summit on migration of Africans and jetted back home the same day? “Why waste scarce public fund to park the jet belonging to Nigeria in London to await the President as if public property has now become a family property? “This is corruption of the severest type when public property is used recklessly just like a privately owned asset by the occupant of the office of Nigeria President. “We regret to state that there is no such antecedent whereby a national leader who embodies the national sovereignty of his country would patronize a foreign Medicare at grave costs to public treasury and to therefore seek to justify or rationalize the callous extravagance of parking the Presidential jet of Nigeria in a foreign territory for as long as one hundred days is absolutely unacceptable and must be halted. 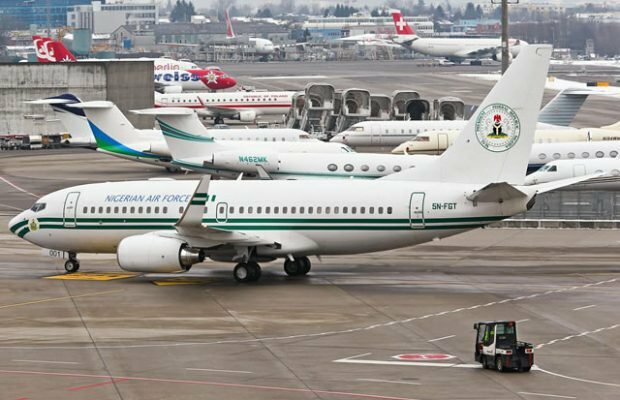 “Let the Presidential jet be retrieved and return to the Presidential wing of the Nnamdi Azikiwe International Airport Abuja Nigeria until such a time the President is prepared to return to work when hopefully he would have regained his health,” it said.